Born and raised in Sandpoint Idaho, SHOOK TWINS are an Indie folk-pop band now hailing from coniferous forested Portland, Oregon. Identical twins Katelyn and Laurie Shook, Kyle Volkman and Niko Daoussis form the core quartet. 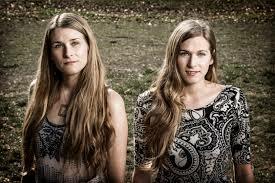 Central elements of the Shook Twins’ sound are a wide range of instrumentation, including banjo, guitar, electric and upright bass, mandolin, electric guitar, electronic drums, face drum (beatbox), glockenspiel, ukulele, banjo drumming and their signature golden egg. Beautiful twin harmonies, layered upon acoustic and electric instrumentation coupled with Laurie’s inventive use of percussive and ambient vocal loops, and Katelyn’s repurposed telephone microphone, set their sound apart, creating a unique and eccentric blend of folk, roots, groove and soul.